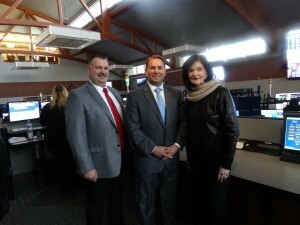 West Long Branch: Sheriff Shaun Golden continues to lead the way in shared services, by marking another milestone, this time with West Long Branch. 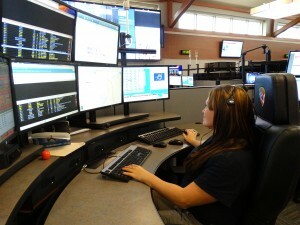 On April 5, the Monmouth County Sheriff’s Office began handling all of the borough’s dispatch operations, which include 9-1-1 emergency calls for service, police, fire and EMS. The move provides the borough with high tech radio communications and cutting edge services. It will cut costs and help increase safety. The change means that when a call comes into the 9-1-1 Communications Center from West Long Branch, an alert will be sent directly to the first responders in the borough. In the past, when a 9-1-1 call came into the center, West Long Branch police and EMS would be contacted first, then, the borough would send out its own alert. This consolidation eliminates one step in the emergency process to address an incident sooner. In an emergency, seconds can make a difference. “The Monmouth County Sheriff’s Office 9-1-1 Communications Center is the most responsive approach and efficient solution for the borough and its tax payers, as we continually look at ways to save money through shared services,” said Mayor Janet Tucci. “The county already answers our 9-1-1 calls and provides fire dispatch services for West Long Branch. In 2015, the center received a total of 607,949 calls, on average, 1,660 calls are received per day.